We’re gearing up for Alumapalooza. The crazy go-go-go schedule has already begun, for us organizers. It won’t stop until next Sunday, June 6. Yesterday was brutally hot, sunny, and humid, but we had to make up the goody bags for the attendees, so we geared up our “git er done” attitude. The job had to be done outside because the sheer amount of stuff going into the bags was too much for any trailer or motorhome. Brett set up a 10×10 tent shelter for shade and kept the bag stuffing-crew (Eleanor, Emma, Lisa, Brett, me) hydrated with bottled water. We stuffed all 150+ bags and then crammed the back of the Mercedes full with them. We can’t put anything in the car until we hand out those bags to the attendees. Fortunately, we are expecting about 70 trailers on Tuesday, so the supply will be drastically cut down early on. Today is the big setup day. Power and water lines are already on the ground, thanks to Mark Wahl’s crew at Airstream, but we needed to flag the parking spots and get the three tents in place. Alice, Tim, Forrest, Brett, and I got the flagging job done this morning, just as artist Michael Depraida was arriving with his big box truck and Airstream. He’ll be selling his very cool Airstream art at the event, as well as artist Brad Cornelius. 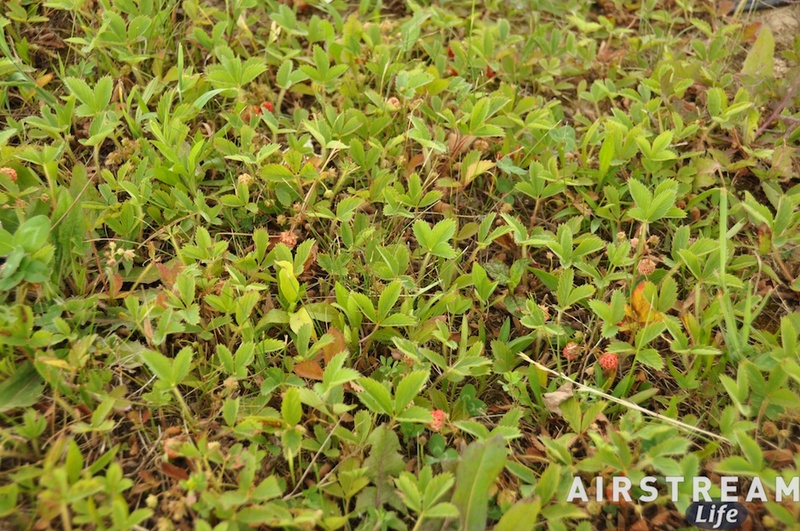 While we were walking the field, I noticed patches of wild strawberries growing. They’re a bit sour but delicious. I’m afraid they will all get turned into jam with all the vehicles arriving. If you notice “blood” on your tires, it’s not because you hit a possum in the road. I was hoping for perfect weather, but that wasn’t realistic. This week looks to be humid, hitting the low 80s most days, and with a good chance of rain at least on two days. Fortunately, our big tent is 100 ft x 40 ft, which is enough space to house everyone in the event of rain. The tent crew showed up around 9 a.m. with four big trucks and they’re erecting the tents now as I type this. Luckily the radar shows today’s thunderstorms far to the east, and although we had a short sprinkle this morning, the skies seem likely to stay dry long enough for them to complete their work. 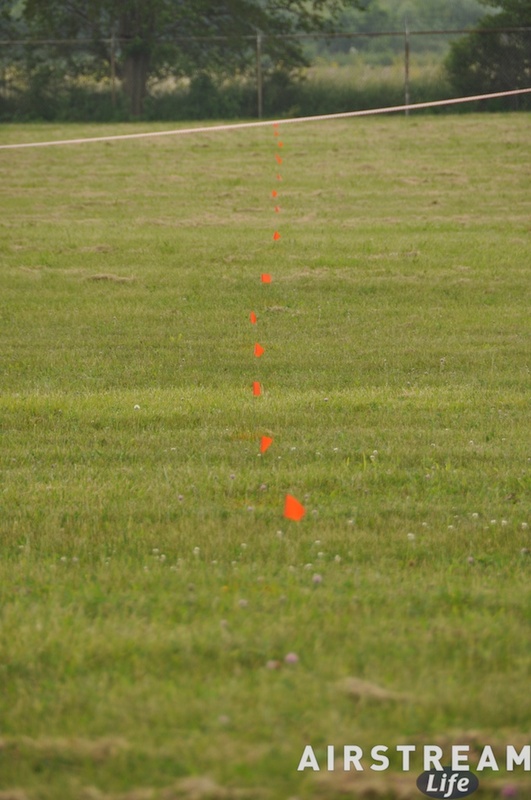 Imagine the row of flags (at right) filled with a line of Airstreams. That’s what this place will look like by Tuesday night. 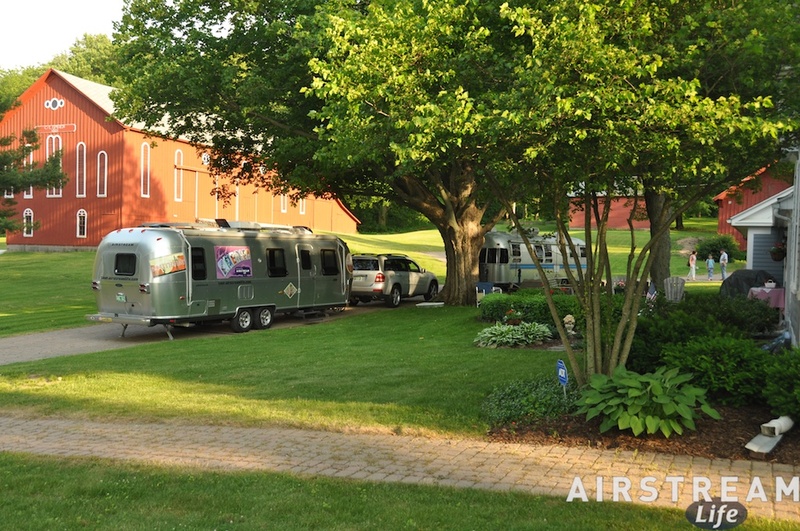 It’s always fun to see the empty field filling up at an Airstream event. A temporary community is built right before your eyes, complete with homes, community center, art, entertainment, education, children, pets … everything. And then at the end of the event, it all dissolves almost magically, leaving no trace that it existed except for a few spots of flattened grass and a lot of happy memories. 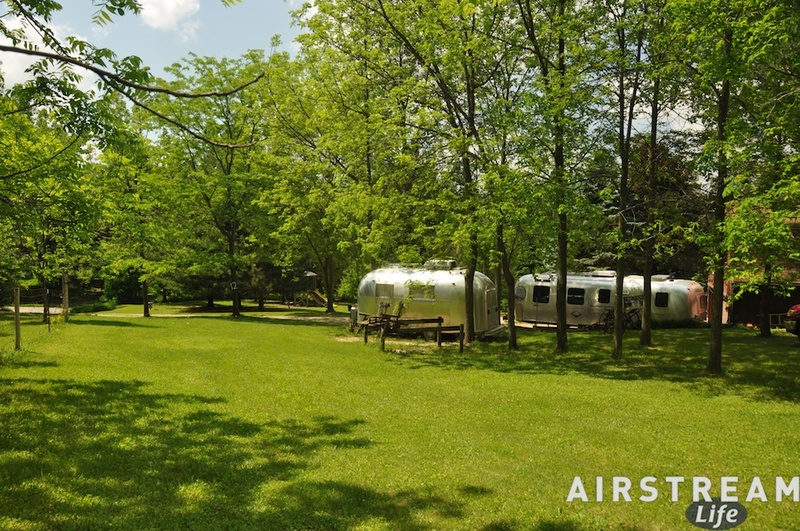 At long last, here we are in Jackson Center, Ohio, the home of AIRSTREAM for over four decades. The Terra Port has been our home many times over the years. It’s a little arrangement of three loops, each with eight full hookup campsites. 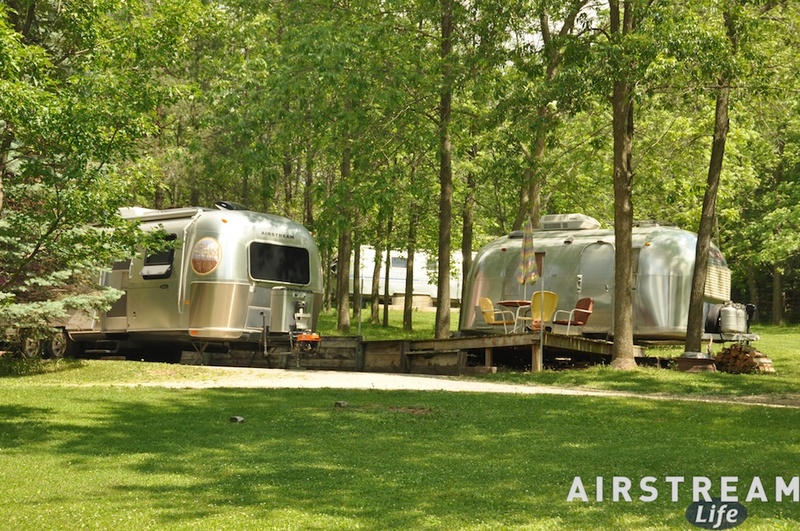 Usually these spaces are used by customers who are here for service, although when there is extra space available any Airstream owners can stay for $10 per day. 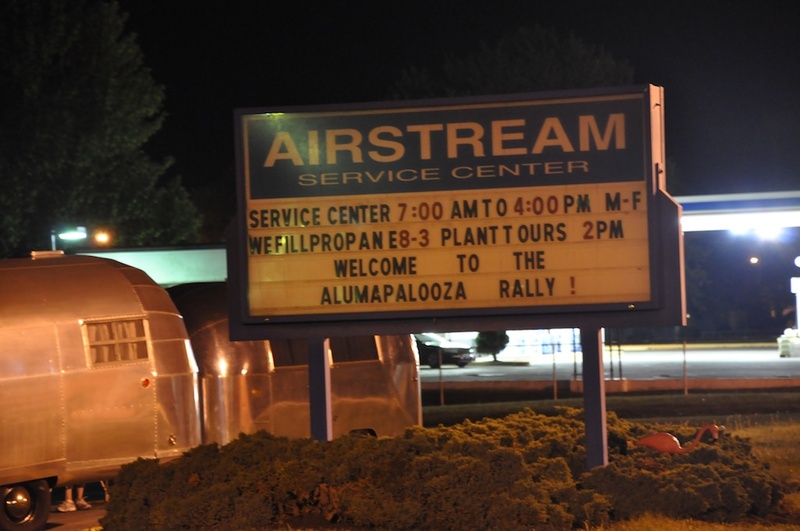 It’s just a short walk to the Service Center, and the factory tour, and the Wally Byam Store, and the outdoor display for antique Airstreams in the front lot. People with “aluminum fever” never seem to get tired of coming here. We pulled in around five p.m. and were instantly surrounded by a bunch of folks who are here for service and Alumapalooza. Gunny is here, as well as Alice and Tim from Florida, and Forrest and Patrice from Denver. Brett showed up about an hour after we did. (All of these people have been subjects of this blog or the Tour of America blog in the past.) People were waving printouts of the tentative Alumapalooza schedule and asking what had changed since. Steve L — a serious Airstream Life fan — came over with his ladder and brush and actually washed our trailer, which was beyond unexpected. (It really needed it. The front was covered with bug guts.) Gunny hung around to harass me, as always, and other folks just came to chat. It feels like the party has already started, and the actual event is still three days off. This is what makes events tick. We spent months working on a program of events that includes over 20 speakers, two professional entertainers, live demonstrations, cookouts, and much more — but in the final analysis the quality of the event is driven by the people who attend. I know personally a lot of the people who are coming, so I know that we’re going to have a great week. Despite having coming to J.C. many times, we still have not managed to visit most of the local attractions. That’s because we are always here for business. We haven’t gone to the Neil Armstrong museum up in Wapakoneta, nor the Bicycle Museum. We haven’t visited the “Kitchenaide Experience,” The Spot To Eat Diner in Sidney, Indian Lake or Grand Lake St Mary’s State Park. We did once manage to see the Air Force Museum in Dayton and we’ve checked out most of the small local businesses in J.C., but that’s about it. This visit probably won’t be any different: we’ve got a full schedule through next Sunday, and then we need to bust out for points east. Like South Dakota, South Bend gets all the credit. You never hear about North Bend, Indiana, do you? I’m not even sure there is a North Bend. Sounds cold up there. It’s not cold in South Bend. We’re still getting that humid and warm weather that has followed us since we left Denver on Sunday. The pollen is out in force, too, augmented by fluffy storms of cottonwood seeds. It’s actually pretty nice to sit in the car for a few hours with air conditioning and a cabin air filter. Our travel today brought us past the least pleasant portion of our journey: the truck-dominated concrete corridor of I-80 as it passes south of Chicagoland. It was bumpy, congested, occasionally slow, and often ugly. We paused only briefly, to drop off Glassie the fiberglass dog to her new owner, Brad. 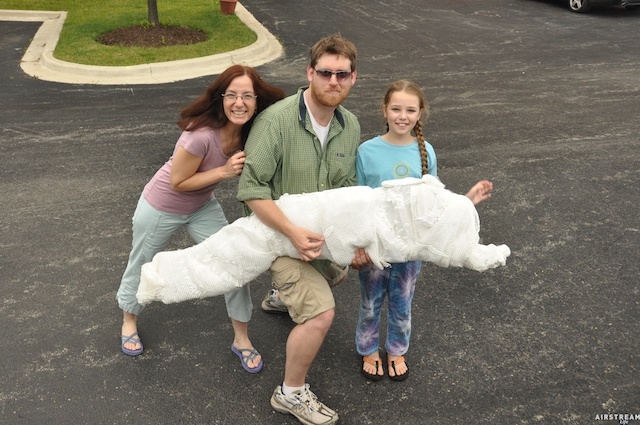 Here’s Brad posing with Glassie (still wrapped in her protective cocoon of recycled paper), and Eleanor and Emma on the auspicious moment of delivery, in the parking lot of a Harley-Davidson dealership. Sorry, Glassie was a bit camera-shy so if you want to see a picture of her you will have to check out Brad’s blog. If we are all lucky he will post a picture there someday. The rest of our route was absolutely not worth talking about, but the destination has made the day’s drive well worth it. We are again courtesy parked with friends, this time in South Bend, IN, under a giant shady tree and near a 34-foot Airstream that belongs to our hosts. This particular stop is memorable because it was Day One of the Tour of America blog. We stopped here right after picking up our Airstream Safari, totally intimidated by the huge new trailer and trying to figure out how everything worked. We did not have the slightest inkling at that time that we would end up living in that trailer for three years! This is the first time we’ve come back to this spot since then, about four and a half years ago. Some things have changed, but our good friends here have not, and that’s all that matters. We’ll have a nice time parked in the driveway. Our plan is to stay for two nights, then head up into Michigan for a night to make one more pre-Alumpalooza stop. Looking at our trip plan, it became obvious that if we spent another night courtesy parking, we’d have a 400-mile drive on Wednesday — and we’ve had enough of long drives already. We decided to hit the road on Tuesday afternoon to break up the trip. This meant that we would have to forgo some of Paul and Marcia’s fine hospitality today, but we made the most of it. Eleanor made a nice lunch for everyone, which we ate out on the patio before our final disc golf tournament (#4 in a series). Emma continues to improve; I keep getting worse. We needed this break. There’s been too much driving lately. As I’ve said many times, it’s not about the towing, it’s about the stopping. This little visit in the country proved the value of stopping off in places where seemingly “there’s nothing to do.” The people you meet along the way can make any place seem special. My mother commented recently that if she knew all the people we did, she’d want to go courtesy parking all over the country too. 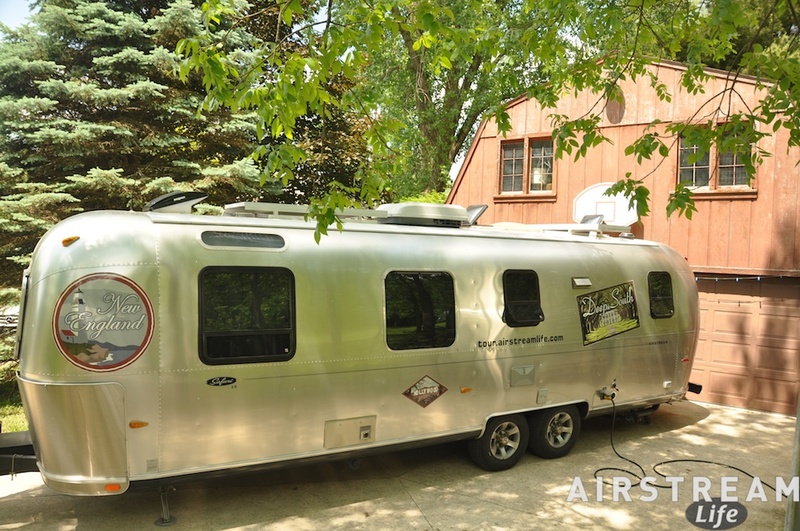 Mom, when you have one of these silver trailers, it works the other way around: you meet the people because you’ve got the Airstream! I can’t count all the great friends we’ve made over the years just by virtue of being part of this community. After lunch it was time to pack up. I retrieved all my technology toys, we dumped out the gray water, refilled the fresh water tank, patted the dog goodbye, thanked our hosts, and headed off. But before we went, Paul and I did the pre-departure walk-around. He’s an experienced Airstreamer, but we all know there’s always something useful to pick up from fellow travelers. I think it might be fun to shoot a quick video on this topic later. We towed only about 150 miles to Davenport IA, right on the border of Illinois at the Mississippi River. This afternoon’s jaunt is more our style: less than three hours of car time. Unfortunately Davenport was under a big line of thunderstorms this afternoon and they lingered until we arrived at 6 p.m. I guess the good part of it was that all the pollen and some of the dead bugs got washed off, but the bad part was that the rain revealed a leak in our Airstream at the skylight. A leak is serious because over a relatively short time it can cause major damage to the floor structure, not to mention mold and other nasty stuff. Normally this would be an easy fix when we get to Airstream (because I have a pretty good idea of the leak’s location). But next week when we are at the factory, the Service Center will be booked solid. And ironically, it’s MY fault, because I am co-hosting Alumapalooza, and that’s what has caused the Service Center to be booked. So I’m going to have to beg the powers-that-be at the Service Center to squeeze me in next week, or wait until Monday, June 7. I mention this in case you think I have some major “pull” at Airstream. I don’t. I’m just another customer, so I’ll be lucky if the leak gets fixed during Alumapalooza. That’s another reason to hope there’s no rain next week! Ah, summer travel. Even though Eleanor and I grew up in the northeast, we have to readjust every time we go north in the summer. It is (as always) sticky humid, which makes a mild 82 degree heat seem excruciating. The front of the Mercedes and the dome of the Airstream are disgustingly decorated with squashed bugs and bird droppings from our 900 mile trek over the weekend. We are all feeling a bit car-burned from having traveled so much recently. All of these things tell me that we need to stop and get acclimated for couple of days. We have traveled from Denver, Colorado to Denver, Iowa for a few days of courtesy parking. This visit has been a long time coming. Paul and Marcia, our hosts, first wrote to us in November 2006. Paul intrigued me with his offer of an 18-hole disc golf course, but we never seemed to be coming through Iowa during our full-timing years. Last year we passed right by on our way to Wisconsin but we were in too much of a hurry stop. But finally everything came together and I wrote to Paul again to ask if his three year-old offer of courtesy parking was still good. It was, so we detoured about 50 miles off our route and plunked the Airstream into a bucolic country setting at Paul and Marcia’s house. What a terrific spot! We are parked on concrete, with an electric hookup and water nearby, next to their 1966 Globetrotter and their 1984 Sovereign, with beautiful shady trees all around and just a few steps from the first tee of the disc golf course. After getting the Airstream established, a round of golf was the obvious first order of business. Eleanor, Emma, and I had never tried disc golf (a.k.a. frisbee golf) but I knew we’d all like it. The course is 18 holes, all par 3, with numerous tricky obstacles (trees) and uphill/downhill shots. Paul of course came in well under par, I came in second (I think I was four under par), and Eleanor and Emma did pretty well too. Marcia drove the golf cart and “caddied.” It was great fun, so we’ll play another round on Tuesday, I’m sure. For today, however, we’ve all got to get down to business. Paul and Marcia have gone off to work and left me with access to the house and a tray of frosted brownies. It’s nice and cool in the lower level of the house, even though it doesn’t have air conditioning, so I’m happy here. I’ve got my laptop and office gear all set up on the kitchen table. That tray of brownies is really horrible temptation, however. Eleanor and Emma have elected to stay in the Airstream and do some homeschooling. Even though we probably have sufficient voltage to run the Airstream’s air conditioner, Eleanor wants to just make do with fans today. She thinks a little suffering in the humidity will get her ready for a summer in Vermont. Being out here in the rural country has given me a chance to break out some of the more esoteric mobile technology that I use. Cellular service is pretty weak here, which means I can’t reliably make calls and my Internet is also marginal. My first corrective measure was to take my Cradlepoint cellular router out of the Airstream and plug it in in the upper level of the barn just behind the Airstream. That got it out of the aluminum shell and up at a higher elevation. The device indicated three bars of signal when I moved it, compared to 1.5 bars of signal inside the trailer, but the service was still sporadic. My next step would normally be to use my Linksys WRE54G wireless LAN repeater to pick up the house’s wifi and direct it into the Airstream. Unfortunately the house’s wifi was password-protected, and the Linksys can’t repeat a password-protected signal. So I moved into the house’s kitchen (with permission), and am using our host’s wifi for the day. This sort of situation is exactly why I keep most of my “office” small enough to fit in a backpack. I often have to relocate to be able to work effectively. Having a single backpack makes it easy to grab and go, whether it’s to a kitchen table, a borrowed office, or a booth at Panera Bread. The other technology challenge of the day was to be able to make phone calls. This is where I got to break out a rarely-used piece of gear, the Verizon Network Extender. I plugged it into the house’s DSL connection, and within a few minutes, it connected and created a cellular phone “picocell.” Now my Verizon phone works anywhere near the house. Instead of connecting to a cellular tower far away, my phone is connecting to the Verizon Network Extender, which is sending the call over the Internet via the house’s DSL.